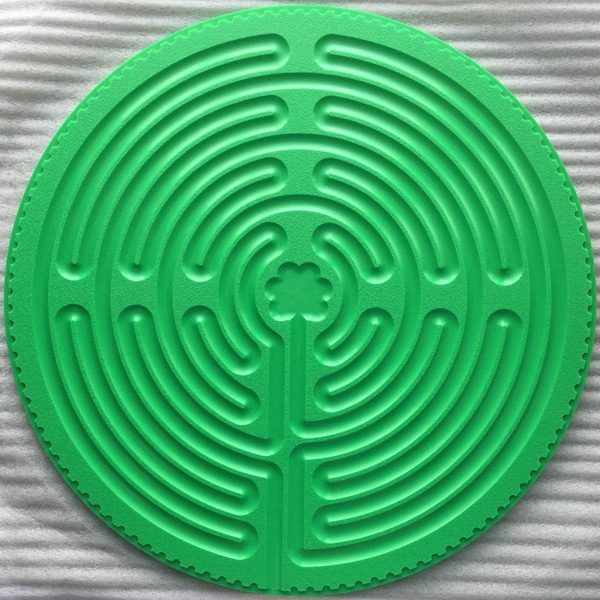 Made from food-grade, highly cleanable plastic, this 11-circuit green plastic Chartres labyrinth pattern is the most popular design in North America and is based on the famous labyrinth that was inlaid into the floor of Chartres Cathedral in France in the 13th Century. Many people travel to this Notre Dame cathedral to walk this pattern. This design is longer to traverse than the Cretan, and therefore the journey to the center oftentimes will be deeper and more introspective than the Cretan design. 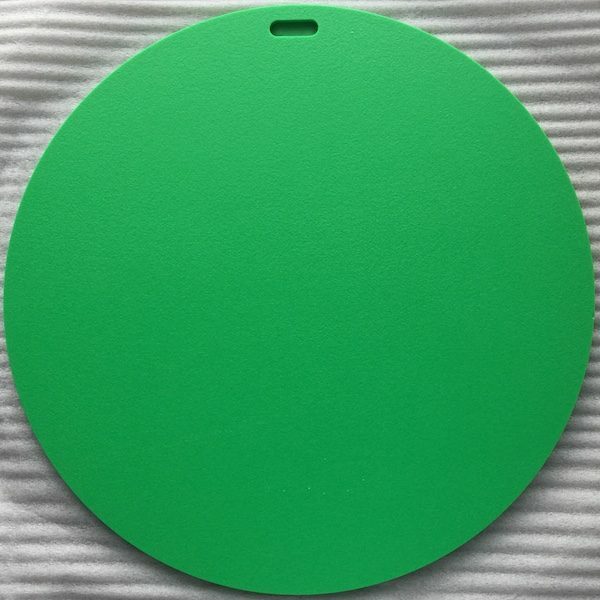 Weighing about 4 lbs., the green plastic Chartres labyrinth has a wide finger path and a notch for hanging on the back. This finger labyrinth or lap labyrinth functions in much the same way as a full-size walking labyrinth, (to further relaxation, meditation and prayer) except that the user traces the path to the center using their finger rather than their feet. For many, this combination of movement (tracing the path) with introspection (eyes closed), is a more relaxing way to meditate or pray. For those whose meditation or devotional practice seems demanding or sporadic, finger labyrinths provide a unique way to bring renewed vitality and meaning to these activities. Since 1997, we have been making this finger labyrinth design with wide, adult-sized finger paths. Ideal for environments where light to heavy cleaning between uses is needed such as a hospital, nursing home, church, elementary school etc. Also a very good choice for outdoor use as, for example, signage for a walking labyrinth or as an alternative to those who physically are unable to walk through a labyrinth.